These are generally considered ball-check Screw Tip sets s. The entire valve is fixed to the feed screw flow through channels on the inside of the Screw Tip Set with a ball or pin to control flow. These designs offer the best consistency for shot control; however, many designs offer very limited flow volumes and can be difficult to purge. Having a fixed rotation with the screw,the largest wear impact is on the outside diameter. General wear of this outside surface dictates the useful life of the Rings . Injection molding valves are subject to extreme forces of temperature, pressure, torsion, abrasion and impact. These forces impact different design valves in various ways, based on factors like injection pressure, screw speed and the materials processed. The most common force concern of molders tends to be the abrasion and wear generated from it. This design provides very high flow volumes compared to other designs, using a concept which supports the ball allowing only lateral movement. This allows the use of larger sealing surfaces as well as flow areas, providing volumes that in many sizes offer similar flow to standard ring valves. The front discharge provides improved flow characteristics over tip and side flow designs, with replaceable internal wear components for extended use. This type of Screw Tip Set are used in such applications where other ball check designs create screw recovery and purging issues. Designed with generous fl ow volumes and direct, highly polished f ow paths, this valve provides very little pressure drop. Providing fast screw recovery rates, it’s easy and fast purging for material and color changes. The P-770 Spin-Lock design leaves very little dead space forward of the feed screw for maximum displacement of the polymer. All three components of this type of Screw Tip Set of castle Type screw tip are manufactured from H-13 tool steel that is heat-treated to the maximum safe Rockwell hardness, based on the valve geometry that will range from 52 to 59. The components are Ion Nitride surface hardened for added wear protection. Nitride provides a case hardness of up to 70 Rockwell with a case depth of up to 400 micron per side. The P-770 performs well on shear or compression sensitive materials as well as general purpose materials and material with moderate fill percentages. It performs well at high screw speeds and when a large percentage of shot size is utilized. This product may not perform well on applications using very high viscosity polymers or materials with more than 18% fillers. Care should be used on start-up to ensure polymer is molten, as the interlocking check ring design is more at risk to damage than other designs. Designed with generous flow volumes and direct flowing, highly polished flow paths, this valve provides vary little pressure drop; providing fast screw recovery rates, easy and fast purging for material and color changes. The P-700 design leaves very little dead space forward of the feed screw for maximum displacement of the polymer. 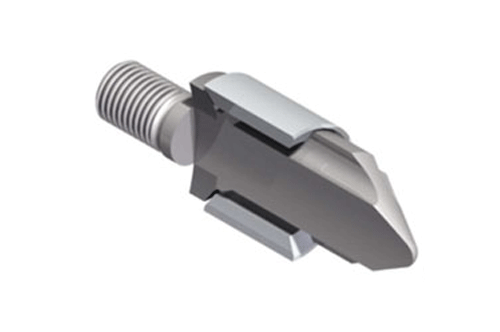 All three components of the screw tip are manufactured from H-13 tool steel that is heat treated to the maximum safe Rockwell hardness, based on the Screw Tip Set and Ring geometry that will range from 52 to 59. The components are Ion Nitride surface hardened for added wear protection. Nitride provides a case hardness of up to 70 Rockwell with a case depth up to 400 micron per side. Recommended for use on shear or compression sensitive materials, general purpose materials and limited run time filled materials. Use on highly fiber filled materials will maintain fiber integrity and result in higher tensile strengths in the molded part; however, faster wear of the Screw Tip Set may be cause. 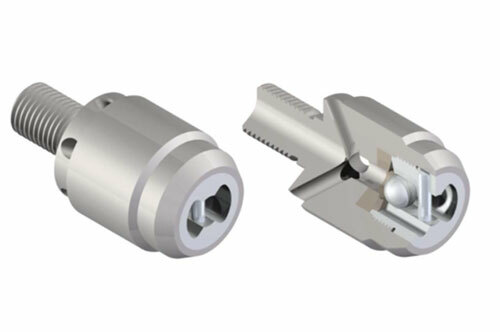 The design may not perform well on applications requiring high or moderate screw speeds or that utilize greater than 75% of the injection capacity. The abrasive action of the ring to Nose contact at fast or prolonged use will generate heat that may anneal the hardness of the tool steel. Applications using moderate to low viscosity polymer may experience shot control (cushioning problems) . The higher flow volumes of this design may allow these polymers to escape before a solid seal is created and cause an inequity of pressures.